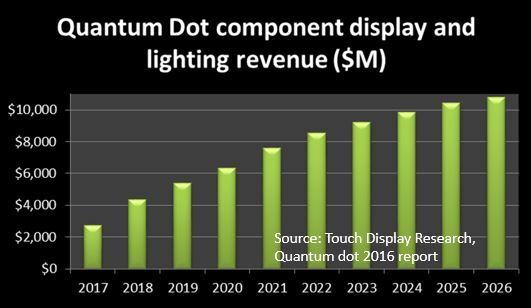 Hyperion Archives - Touch Display Research, Inc.
At SID 2016 DisplayWeek, quantum dot is continued to be hot topic, even hotter than last year. (see our blog about last year’s SID). Nanosys announced two good news. Nanosys announced that Hitachi Chemical and Nanosys have partnered in the development of QDEF (quantum dot enhancement film) for display applications. Hitachi Chemical plans to begin shipping QDEF in mass production volumes during the 2nd half of 2016. Nanosys also announced a breakthrough quantum dot film—Hyperion. Hyperion Quantum Dots have Cadmium in it, but very little, below 90 ppm. In the European Union’s Restriction on Hazardous Substances (RoHS) Directive, it requests any component with Cadmium must be <100 ppm (which is 0.01%). RoHS never requests Cd-free. Now, Hyperion QDs meet this requirement, so it doesn’t need to request exemption. Touch Display Research believes this is very clever. How is Hyperion’s performance? More analysis of Hyperion can be found in the Touch and Emerging Display monthly report. Figure: Nanosys quantum dot demo at SID 2016. QD Vision also showed TVs with Color IQ and new TPV’s AOC brand monitors with Color IQ in them. 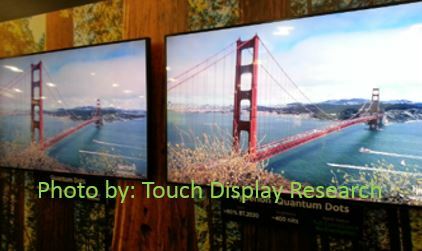 Three new quantum dot companies had shown Touch Display Research their QD samples recently. This entry was posted in Company News, Conference Review, Displays, Quantum dot and tagged Color IQ, Hitachi Chemical, Hyperion, Nanosys, QD Vision, QDEF, quantum dot, Quantum dot market forecast on May 27, 2016 by jennycolegrove.